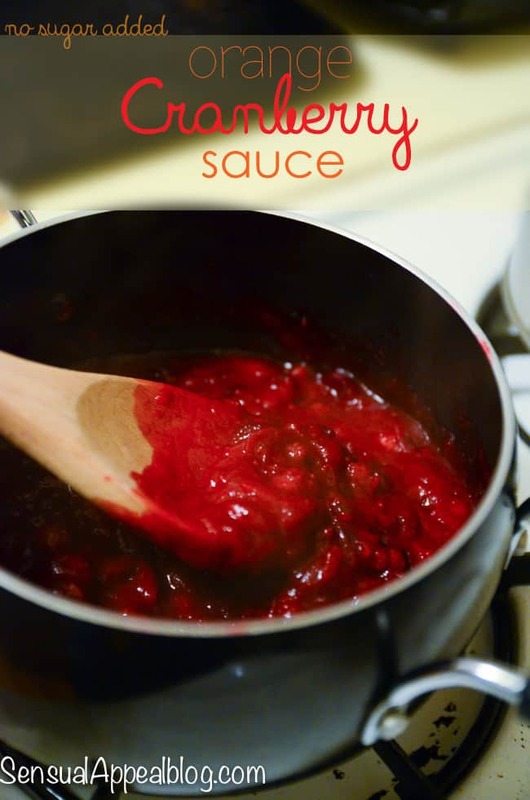 This homemade and healthier orange cranberry sauce recipe is vegan and has no additional sugar added! The sauce is slightly sweet from Xylitol but mostly nice and sour. A staple for your Thanksgiving dinner table. Ohh.. the scent of freshly cooked cranberry sauce. It smells so good..
As I mentioned in my previous posts about Thanksgiving, I am not American and my family is very small and therefore I never really had a “legit” Thanksgiving dinner until I had Friendsgiving with my closest friends on Friday. It was my first experience with having the real traditional Thanksgiving dishes that American families usually have on this special day. I know the basics of what the staples are for a Thanksgiving table. I mean, I AM a food blogger after all – these things you just know, no matter if you celebrate or not haha. We had some variation of it at our house in the suburbs with my parents but never to the extent we did on Friday with my friends. 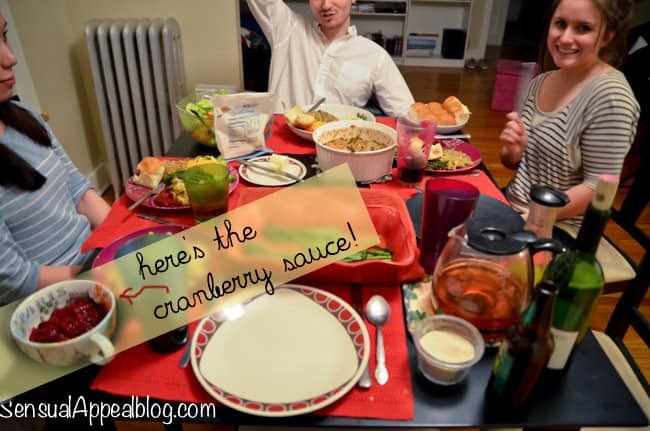 Today I’m sharing the lovely cranberry sauce recipe I made for the dinner. I knew cranberry sauce is usually bought in cans by many families and it is totally sugar laden. You know me and stuff like that – that’s just not my style. So I volunteered to make my own version of cranberry sauce! It would be my first time making cranberry sauce.. I love trying new dishes. Such a fun experience each time. I found a lovely homemade cranberry sauce recipe on Oh My Veggies blog but I couldn’t find ginger beer anywhere and didn’t wanna buy a huge thing of ginger ale since I don’t drink soda so what would I do with the rest of the bottle? So I improvised. The ginger flavor was gone but hey, the sauce was still amazing! I loved making this sauce. The cranberries were popping and it was fun. The first few pops totally scared me though even though I expected it to happen. Cranberries are filled with pectin which causes them to pop while cooking. This is also the reason why the sauce gets so nice and thick. 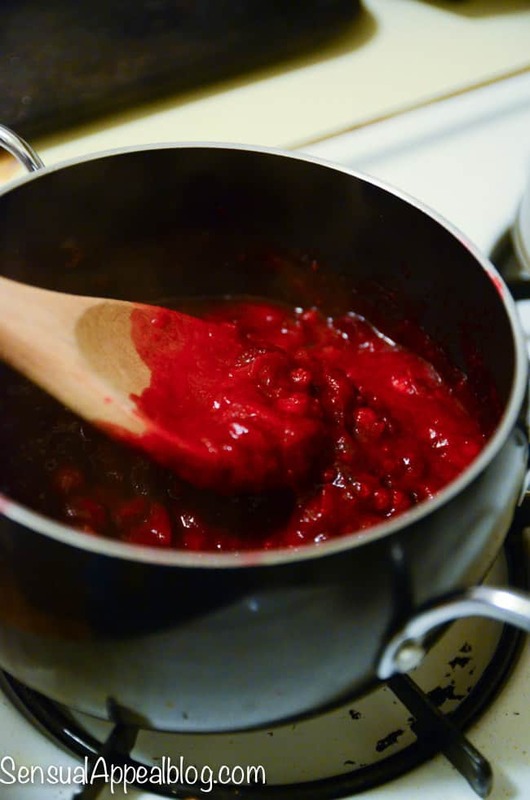 They often add pectin to jams and jellies to make it that consistency but cranberries have it naturally! Needless to say the consistency of this Orange Cranberry Sauce was perfect. The sauce was more sour than sweet because I added very little added “sugar” but if you prefer yours sweet you can go ahead and add more Xylitol or organic cane sugar. Xylitol is a sugar alcohol so too much of it may cause some tummy issues for certain people so I would recommend against using too much of it. You could maybe also add some extra stevia drops in there instead of adding additional Xylitol! That would probably be your best bet 🙂 I’ll do that next time around. I’d say maybe 15 drops of Orange Stevia should do the trick as it’s off the heat. Stir it up and let it cool. Then enjoy! If you aren’t on Botanic Choice yet, sign up today and get up to 75% off your first purchase! Totally worth it. This is my go-to place for all online health food shopping! Mmm… I loved eating this sauce with pretty much everything! Check out the plate (sans chicken at the time since it was last to finish cooking). See the other great foods we ate at Friendsgiving here! 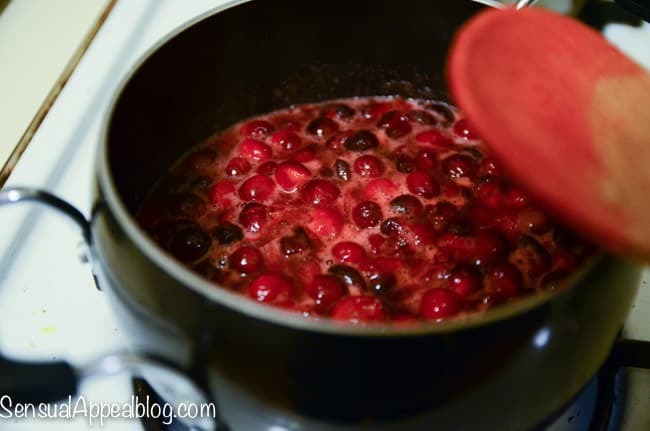 Cranberry sauce: homemade or canned? What is your favorite thing to eat with cranberry sauce? Yum Kammie! The cranberry sauce looks incredible!! I love cranberries and oranges together! Happy Thanksgiving!!! Kammie, your cranberry sauce looks yummy. I used orange in mine too but couldn’t give up the sugar. Oh well. I will save your recipe for next year.